Tickle My Senses: Eid Mubarak and A Delicious Muslim Biryani Recipe!! Delicate long grains of Basmati rice gently cooked with fragrant whole spices, layered with a deliciously spicy chicken gravy thats bursting with the flavours of powdered spices, ginger-garlic, tomatoes and yogurt. Heightened by the flavours of saffron infused milk, golden fried onions, raisins or prunes, fresh coriander, mint leaves, citrusy lemon and powdered garam masala. All the happiness and Joy of this world, May God's Blessings be with you always. Salt: 2 tsps or to taste. Black cardamom pods: 3 nos. 1. Take the thick yoghurt in a bowl, beat well, to it add powdered spices and salt to taste. Add the slit green chillies, chopped mint leaves, coriander leaves mix well. Finally add the cut chicken to this mixture, mix well. Cling film bowl and rest overnight in the fridge. 1. In a large non stick vessel take oil and heat it. Once hot add the finely sliced onions and fry until it is light golden brown. Keep aside 1/3 of the fried onions on a tissue paper for the final garnishing required while layering the biryani. 2. To the remaining brown onions in the pan add the whole spices ie cloves, cardamoms, black pepper, cumin seeds, cinnamon, black cardamom pods and bay leaves and fry till fragnant. Next add the ginger and garlic pastes and fry for 4-5 minutes till the raw smell goes away. Next add the powdered spices (chilli, coriander, fennel powders) and fry for 30 seconds before adding the tomatoes and the salt. Fry the tomatoes till they turn soft and moisture completely dries up. Add the marinaded chicken and yoghurt mixture to the vessel, mix well. (Add water only if needed to cook chicken) The chicken usually lets out water. Close the vessel and allow the chicken to cook for 30-35 minutes on medium heat until almost done, stirring in between. The gravy should be semi thick. You will know when the chicken is ready as the gravy turns darker in colour and oils starts floating to the top. 4. Next check for salt, squeeze over lemon juice to your taste turn off the heat. 1. Wash the rice in a large bowl till the water runs clear, then soak the rice for about 20 minutes. Once 20 minutes are done drain the rice in a colander and keep aside. 2. As the rice is soaking prepare the water in which it will cook. In a large vessel boil around 15 cups of water (you need to make sure the vessel you cook in is large enough to accomodate the water and the rice. If the rice has enough room to cook in you can see the grains of rice dancing about freely as it cooks and the grains freely lengthens to its maximum length. But if the vessel is too small the rice will not have enough room to cook in, the grains of rice will tend to stick to each other and clump. 3. Once the water comes to a boil, add the bay leaves, cinnamon sticks, black cardamom. Close the pot and let the spices let out their flavours into the water for 3-4 minutes before you add the rice. 4. Add the rice to the boiling water, stir gently. Add salt to taste (add a bit more salt). Add lemon juice to the boiling water and a dash of oil to help keep the grains of rice fluffy and seperate. Let the rice cook for 6-8 minutes or till the rice is half done. To check this, take a grain of rice and press it between your index finger and thumb, if it breaks leaving a white seed of uncooked rice in the center your rice has cooked just right. Turn off flame and drain the rice immediately to a colander. Spread out the cooked rice to a large tray to allow it to cool. 1. Take a large pot that is oven safe. Grease the base lightly with oil. 2. Place half the cooked rice at the bottom of the pan. Evenly distribute the pieces of meat over the rice. Then pour the gravy evenly over the meat. Add the remaining rice over the meat, level the rice gently to form an even layer. 3. Sprinkle over the chopped coriander and mint leaves and reserved browned onions. 4. Using the back of a spoon make a few tunnels through the rice and meat layer. Pour in drops of saffron milk through some tunnels. Through the remaining tunnels pour in drops of lemon juice and rose water. Sprinkle over a garam masala powder. You could add a few drops of ghee over the rice. 5. Seal the pan with foil and then place a lid over it. Place in preheated oven at l80 C for 25-30 mins. Gently mix it before serving. Serve with a cucumber and tomato raitha. Do drop me a line if you do make this biryani. Would love to know your experience. I just copied the recipe for your biryani, a long process indeed, could be short scripted. Very interesting recipe. This seems like an awesome tasting biryani you have. I cook a traditional biryani but similar biryani. 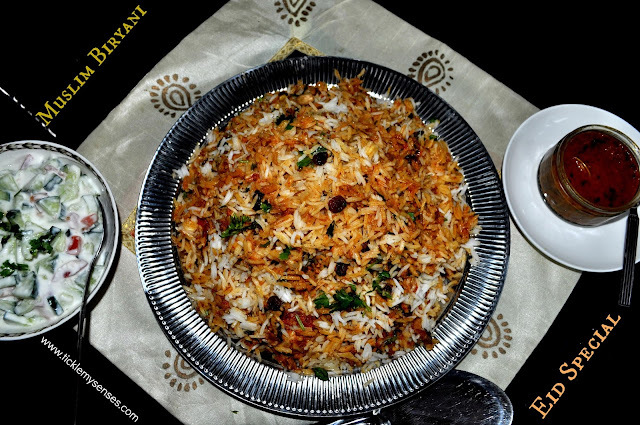 Your method on this biryani looks full of flavour and robust in taste, the steps involved in preparing. Really interesting. I will definitely try it.my problem is my rice always gets over cooked. I prepare Biryani in Exactly the same way. In addition in masalas you have skipped Javatri (MACE) and jaiphal (NUTMEG) which is must for biryani. 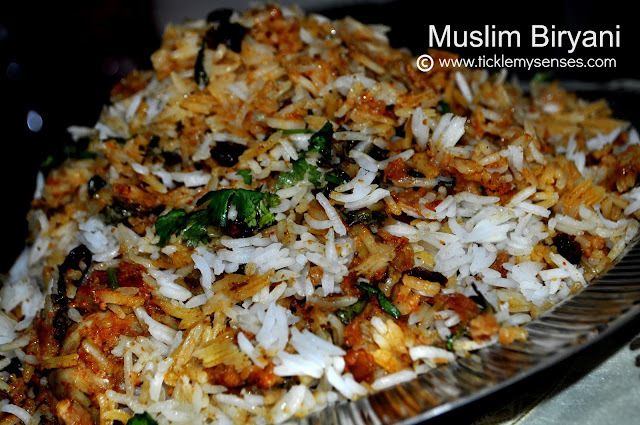 Iam a hindu briyani lover,i make mutton briyani similar to that of urs. But with few difference ie. Abt the marinating part. It also really taste good. U know i also go in search of muslim briyani often. This recepie which i make was told to me by one of my friend. And i found it similar to urs. I can smell ur briyani. 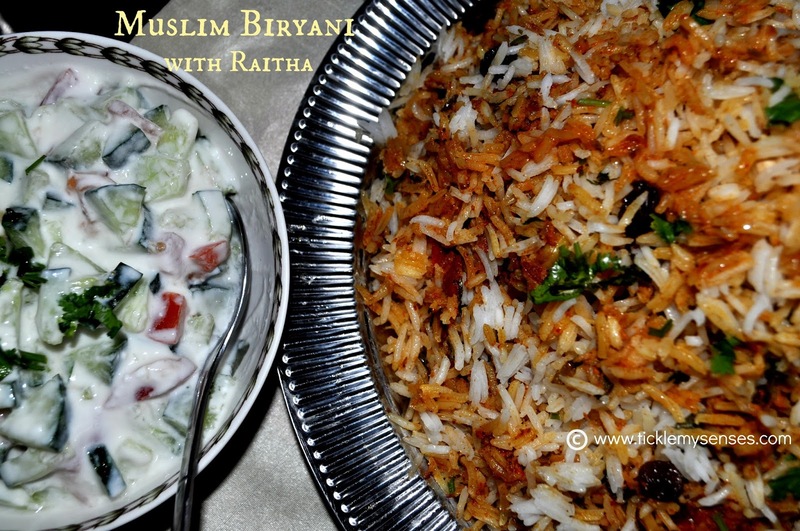 Thank u.
Hi, I followed you recipe and my biryani came out really nice!! Today I am gng to try the same recipe with Mutton. Just wanted to know, for how long do I fry the mutton and bake it, so the mutton is cooked well! Just prepared.. it ended up so yummy n delecious..
Hi Carol. The Biryani is just fantastic. Love all your post. Thks for posting. Have a lovely day. Take care. Looks like a delicious recipe! Can't wait to try it! Perfect recipe! Thank you! 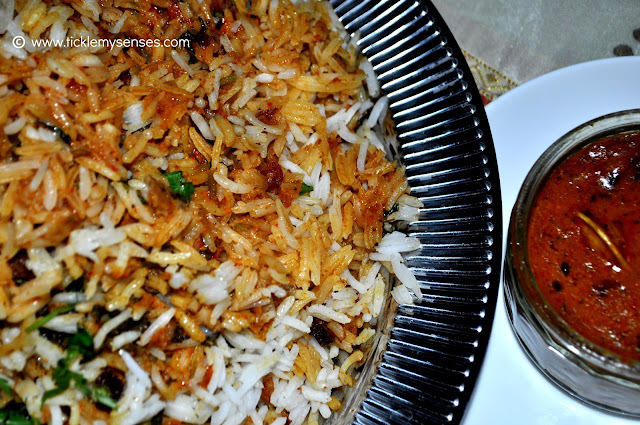 I have always been looking for a perfect biryani recipe and this turned out just the way my family and I wanted! Perfect! I have always been on the lookout for an authentic biryani recipe and this turned out just the way my family and I wanted! Thank you. So glad you liked the recipe. Hope you find more recipes. Canned Tuna Spicy Fish Cutlets.